As we continue our lobbying in Washington, D.C. to reform the Windfall Elimination Provision (WEP), reports indicate that the national public employee unions are now analyzing HR 711. Support of these organizations could prove essential to a bill passing during the current Congressional session. Congressmen Kevin Brady (R-TX) and Richard Neal (D-MA) filed HR711. The bill now has 40 cosponsors – 23 Republicans and 17 Democrats, including all 9 Massachusetts Congressmen. July 2015 Voice: A milestone in our efforts to reform the Social Security Windfall Elimination Provision (WEP) was reached in late May, when all nine members of the Massachusetts Congressional Delegation had officially signed on as cosponsors of HR711 – known as the Social Security Fairness Act. 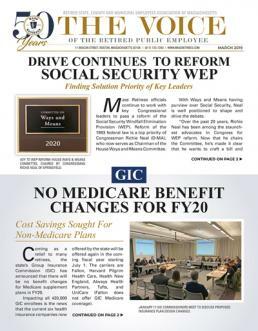 NOVEMBER 15, 2014: This week marked the first significant development toward providing retirees with relief from the Social Security Windfall Elimination Provision (WEP) in several years. On Thursday, Congressmen Richard Neal (D-MA) and Kevin Brady (R-TX) filed H.R. 5697, The Equal Treatment of Public Servants Act. The bill is the direct result of nearly a year’s worth of collaboration between our Association, the Texas Retired Teachers Association and Ohio Retired Teachers.